December 13, 2016: It’s been a little while since our last NoteCard release, if you were keeping track, but today marks the end of the NoteCard 3.3 era. Will any of us ever know again the heady excitement and limitless optimism of that special time? Click the arrow to download NoteCard immediately. After downloading, open the file to install the game. November 2, 2011 But not really a commercial. Just a simple song about a schoolyard spat unimproved by Santa’s Secret Valley. Those who brave this video will hear (pianoware and vocal) but not see me; titles and the lyric are the only imagery. October 20, 2011 This is a maintenance update of the FamilyGames.com freeware game Hierophant. Changes include fine-tuning of the installer and minor cosmetic tweaks. Click the arrow to download Hierophant immediately. After downloading, open the file to install the game. 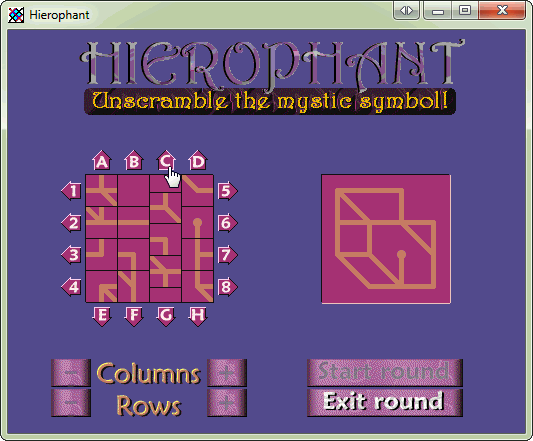 For those who don’t know Hierophant, it is a simple 2-D game, generally reminiscent of a 4x4 tile puzzle. Unlike the usual toy version, however, there is no missing tile. Instead, movement is permitted by having the rows and columns wrap around. The object of Hierophant is to restore a randomly-generated ‘mystic symbol’. Hierophant is compatible with computers running any version of Microsoft Windows since Windows XP. Scrolling a column in Hierophant by clicking one of the arrow buttons (C) around the board. August 4, 2010 The biggest new feature in version 1.9 of World Geography Tutor, which we’re rolling out this week at FamilyGames.com, is the optional larger view that is now supported. Some users have found WGT’s small window size a matter of curiosity since the app first came out back near the turn of the century, and admittedly it might seem like an odd choice. After all, is it not more convenient to work on a large, non-scrolling map if the monitor screen is big enough? Why doesn’t World Geography Tutor provide that option? May 12, 2010 This new release of our Christmas game for ages 3-7 is an incremental upgrade to address a couple of long-outstanding issues. 1) The installer. Although our old installer worked reasonably well under all current Windows operating systems, including Windows 7, it fell short of full compatibility. An effect of the change is that saved games and other data are no longer stored under the Program Files folder, but under the public application data folder instead. 2) The configuration system. Configurations in I Live at Santa’s House! have two purposes: on the one hand, they allow certain customizations for one or more children individually; and on the other, they create separate identities for saving games. They are created with the Santa’s House configuration utility, SHC. Previously, creating a new configuration was too complex for many users to bother with, involving the manual creation and editing of a desktop shortcut, among other steps. Now it’s as easy as pie. We’ve added a manager for multiple configurations to SHC, and all the hard work is done for you. For those who don’t know, I Live at Santa’s House! is one of our most popular games. It gives little ones a chance to find out what life is like for an elf living and working in Santa’s House at the North Pole. Testing toys, wrapping gifts and baking cookies are just a few of the activities an elf can enjoy, so it’s no wonder that this game has been a seasonal favorite for many families year after year. Kids love the idea of helping Santa, especially when it’s so much fun! June 1, 2009 For a decade or more our NoteCard 2.0 freeware has languished in relative obscurity as an unassuming little tool to help beginners learn the musical notes. In fact (as the ‘2.0’ reveals), an even more primitive NoteCard once walked the Earth. That NoteCard ran on the Commodore 64, a very popular machine from the Dawn of Personal Computing. But even NoteCard 1 wasn’t the real beginning. That was a year or two earlier when I was teaching piano in Toronto. Like many piano teachers, I had several students who found it frustratingly difficult to master note-reading, to such a degree that it was a real barrier to progress. And, again like many others, I had the idea of creating decks of musical flash cards — small cards with a staff note on one side and the note name on the other. Flash cards are great. They are the quintessence of manual drill: there’s nothing like them for learning foreign vocabulary, for instance. Anyone who has tried to learn vocabulary from a simple written list has probably noticed an inherent problem with that method: you end up learning the information as sequenced. What flash cards contribute is randomness. They let you develop your ability to recall information without the crutch of a predefined ordering. They teach you to be mentally ready for the rough and tumble of information in the real world. Another benefit of flash cards is total focus on the learning task: there is no overhead, no frills, no distracting frivolities. And they work just as well for musical notes as they do for languages. The new release, NoteCard 3, includes all these features and more. For instance, another key addition is support for multiple users, each with their own settings and records. NoteCard 3 allows up to three users to share a single installation of the software. With all these enhancements, the software is no longer limited to being just a passive tool. Now it can serve as an active guide, a tutor able to react and respond to the user’s individual learning situation. NoteCard 3 is available for download and purchase immediately from AheadWithMusic.com. The software includes a 10-day trial of its two modes: Paid and Free. Users can learn their notes perfectly well in either mode, but the Paid mode offers a cluster of bonus features that I hope many users will value. If a Paid License has not been purchased during the 10-day trial, the software continues indefinitely in Free mode.